Gulf Strike: How do you solve a problem like Saudi Arabia? In this article, I'm referring to Scenario 1 of Gulf Strike where the Iranians are thundering down through the Saudi Peninsula with the help of their Soviet buddies, trying to close off American access to the Persian Gulf before the US can rush in carrier groups and Marines and air and endless amounts of supplies for their beleaguered buddies of the Gulf Council States. So you're playing Iran and turn one has gone fairly smoothly. You've had Kuwait all to yourself to beat the hell out of and now it's conquered and turn two starts. The Gulf Council States immediately declare war on you. With budding optimism, you push your first armored unit south from Kuwait City on its long march towards Riyadh. If this next step of the takeover plan of the Middle East is not thought through carefully enough, you'll be thinking to yourself by turn 3 or 4: "Wow, this is going to be tougher than I thought!" 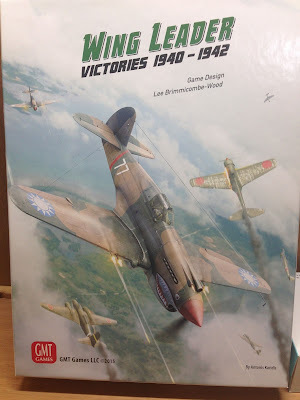 Wing Leader Victories 1940 - 1942 is a really fun air combat game. I got it last year as an impulse buy during a time when I had a million other things going on in my life. As a result, it slid right into my collection like a stealth plane, its presence barely detectable among all the other clutter of my busy days and frantic nights. During a self-imposed lull in my life when I should have been hard at work at something or other, I spied it on my shelf. I pulled it out and wondered how on earth I had failed to be enticed by the box cover's lovely artwork featuring a P-40 Warhawk screaming down through the shattered skies. The components are nice with plenty of reference charts for easy play. It has a nicely organized rulebook and there are plenty of scenarios covering a wide swatch of air combat that characterized the early days of World War II.